After the release of Kayal a few days back for Christmas, the debut lead actor Chandran has been quite the cynosure of all eyes. 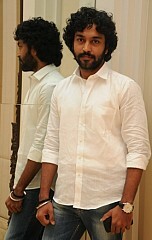 His impressive performance has been noted and audiences have also pointed out a resemblance in him to Vaaranam Aayiram’s bearded, long-haired Suriya. In this chat with Chandran, I discover more about him and on all the miles that have gone into his journey to the silver screen. “I am based in Chennai and graduated from the Vivekananda college. From my first year in college, I got a huge interest in cinema. Even after my post-grad, my heart and soul was always in films. During a 6 months’ break, I packed my time with auditions but it didn’t help. I was also prominent in the theater space and in short films. I must have done about 10 to 15 of them and also directed a few. “We shot the film across India in never seen before locales. From Leh, Ladakh to Rajasthan’s Ajmer, Pushkar to the North East’s Shillong, Cherrapunji - Bangladesh border to Kanyakumari, Madurai, Virudhunagar, Mayavaram down South. “From King to Kokki to Laadam to Lee, I have followed his career closely, seeing all these films (an ‘every Friday movie guy’). He is a household name now after Mynaa and Kumki. Contrary to popular belief, he isn’t a taskmaster. From 6 to 6, the whole unit would be splitting in laughter. He is a nice, kind and helpful gentleman but makes sure that work is done. He is a mood-based director and based on the scene's mood, he would behave accordingly and extract the right performance from his actors. “The Dolby Atmos sound system would enhance the effect for the tsunami scenes. It is all a huge crew’s work and it would be pleasing to the eyes and ears. “Releasing on the 10th anniversary of the devastating tsunami in 2004, Kayal is dedicated to the victims and their families. We realized the importance and have made sure that there are no emotional misfirings. The film is highly expected and we are all keeping our fingers crossed for the final verdict. It would be an enjoyable emotional ride. "Escape Artists Motion Pictures have a great graph. It was a double blessing that I was in the right hands like Prabhu Solomon sir, Madan sir and James sir. I was relaxed and was able to sleep peacefully thanks to their brand, which is enough to market a film. Imman Anna’s music is another check in my list. I have been a fan since his Thamizhan. The last 20 to 30 minutes of Kayal is a complete musical journey, packed with emotions. Imman's live recording would be another character by itself. I am sure that he would bag all the awards. I wish to thank Madan sir, James sir and the complete cast and crew for this experience." KB Sir, Please get well soon ! "I love the simplicity and humility of Mr. Rajinikanth"
"The simple formula behind Nanban and Pokkiri's success"
Victimizing Vishwaroopam: the looming threat to our movies! A simple favor from Thala ? Even a cinema hall warrants some discipline! Will Singam become as legendary as Dirty Harry! Anandhi - "I like all movies of Dhanush"